Item EA-600-589a - Royal Canadian Air Force decorates 4 civilians and 35 members and former members of the RCAF at the North West Air Command Drill Hall: Flt. Sgt. F. J. Payne receives the British Empire Medal from His Honor Lt.-Gov. J. C. Bowen. Royal Canadian Air Force decorates 4 civilians and 35 members and former members of the RCAF at the North West Air Command Drill Hall: Flt. Sgt. 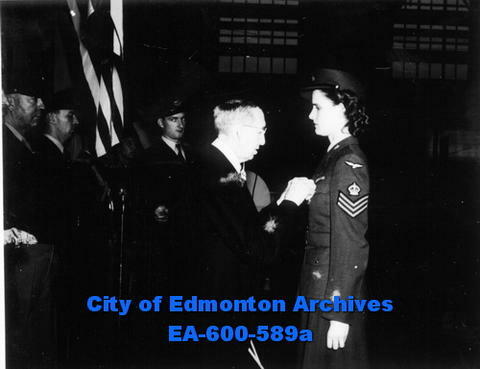 F. J. Payne receives the British Empire Medal from His Honor Lt.-Gov. J. C. Bowen. Inglês » Royal Canadian Air Force decorates 4 civilians and 35 members and former members of the RCAF at the North West Air Command Drill Hall: Flt. Sgt. F. J. Payne receives the British Empire Medal from His Honor Lt.-Gov. J. C. Bowen.